A self-proclaimed ‘dude with a truck’, Dr. Luke Bass takes his passion for horses and love of helping people and animals everywhere he goes. After admittedly spending more time at the party than the library in his first years of schooling, Luke learned from his mistakes and pulled up his bootstraps to pave his way to an impressive resume and thriving career in the equine field. Nowadays, he spends his time training equine veterinary students in the field and has a seat on the CSU admission board, among many other hobbies and projects. Today Luke is sharing what can set you apart from the crowd in applications, why it's not always about the grades, and why you should be making self-care a priority. Everything from gangsta rap, to acknowledging your own self-flaws, and how to communicate what you are worth, is on the panel. 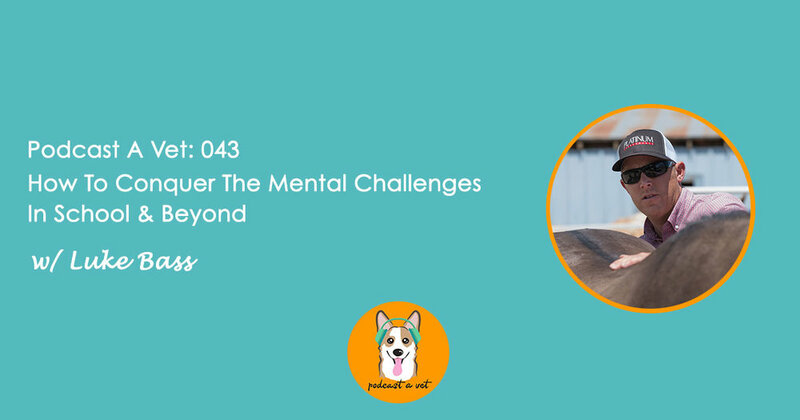 Prepare yourself for a no holds barred episode as Luke cuts the curtain and gets real about how to succeed in veterinary medicine and in life. Do you share a similar equine passion? Inspired by Lukes approach to problem-solving? Let us know your thoughts on today's discussion in the comments below!